Are Retailers Finally Ready for Google Trusted Stores? Google didn't receive the interest it hoped for from retailers when it launched the Trusted Stores program back in 2011 (likely due to the complexity surrounding earning that designation), but after announcing a series of changes recently it may be back on track to reach the high expectations the company once had for the program. Perhaps a quick recap is in order. 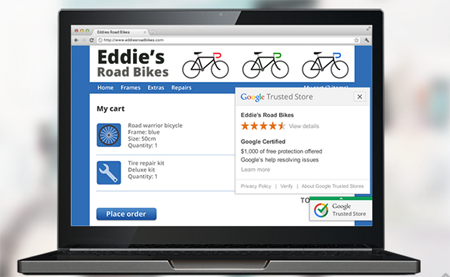 Google evaluates participating merchants on a number of variables for the Trusted Stores program, including their shipping reliability and customer service performance (based on consumer reviews and ratings), in order to ensure a high-quality online shopping experience is provided to users (Google uses data provided by StellaService to evaluate merchants). Those merchants that are awarded with the Trusted Stores designation are then able to display the certification badge on their site and on Google Shopping, which, upon clicking, reveals the merchants score to the viewer (prospective buyer). The problem is that merchants were forced to jump through quite a few digital hoops to participate in the program. Fortunately, a recent set of updates should interest merchants that have yet to give it a go. Online retailers now only need to create an account and add a few lines of code - no need to submit those complicated shipment and cancellation feeds - and can now specify a custom position for the Trusted Stores badge on their sites and display it on HTTPS pages. Merchants can also highlight their Trusted Store status in their AdWords listings. Google indicates it has been operating the Trusted Stores program in the UK, Germany, France, Australia and Japan for several months, and that merchants including Newegg, VistaPrint, Wayfair and TigerDirect have qualified for the program in these countries.